Kevin Stoner, following 17 years of experience in communications technology, has joined Media Vision USA as director of operations with responsibilities encompassing the oversight, management and guidance of large projects, customer service, and expansion activities. Kevin will be working out of the New York City office, opened by Media Vision in 2011. For the past 10 years, Kevin was based in Utah where he developed expertise in audio conferencing technologies and leadership skills. “Kevin has a solid track record of overachievements in all segments of our activities including product management, quality control and staff oversight," said Fardad Zabetian, CEO of Media Vision. “His strategic thinking and focus on the customer experience makes him an obvious fit for the position of Director of Operations, in accordance with our company’s customer-centric philosophy“. Kevin is excited to be joining the diverse team of Media Vision USA. He explains his career move highlighting “the opportunity to have a leadership position and effectively drive business operations in a context of continued growth." 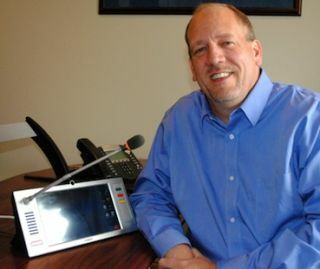 “I see two reasons for this growth: first the company itself and its leadership, and second the products,” Kevin said, following two weeks of training at the California headquarters, “All product lines are very solid; but the TAIDEN 8300 Multimedia Terminals with touch screens show impressive advancements in the market and I am fully confident the TAIDEN R&D team will allow us to keep the edge." One of Kevin’s main responsibilities will be to act as program manager for the provision of congress microphones and simultaneous interpretation systems to the United Nations Headquarters in New York, a remarkable project recently awarded to Media Vision USA.